A nickname for a section of Paddington (or is it Maida Vale?) centred on the junction of Regent’s Canal and the Grand Union Canal (which links through to Paddington Basin), the origins of the term Little Venice are somewhat mysterious. Some claim the area owes its moniker to the 19th century poet Robert Browning who moved back to London from Italy after his wife, Elizabeth Barrett Browning, died in 1861 and settled in the area until 1887 (before returning to Italy – Venice – where he died in 1889). It was while living in the area that some say he apparently coined the name (his residence there, meanwhile, is also noted in the naming of Browning’s Pool, located at the junction of the two canals). Others, however, give credit to another iconic 19th century literary figure – Lord Byron – but suggest the context wasn’t so much praise but rather a wishful statement noting that London could have had its own Venice if the canals weren’t so filthy. Either way, the name apparently didn’t gain much currency until after World War II (and the ‘Little’ was apparently a late addition – the area was first simply known as London’s Venice). 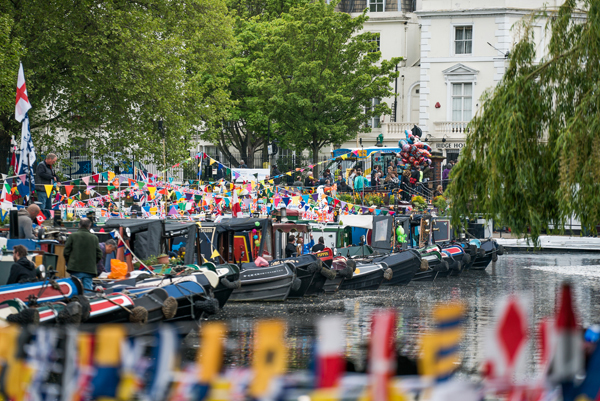 These days, Little Venice is a sought-after residential district and hosts some great cafes as well as pubs and theatres – including the Puppet Theatre Barge. It also serves as a terminus for various canal boat companies and hosts the annual IWA Canalway Cavalcade, which has been taking place since 1983 (pictured above). As well as boasting its own island, Browning’s Pool, meanwhile, is also home to Rembrandt Gardens, named so in 1975 in honour of the 700th anniversary of the founding of Amsterdam. Robert Browning aside, others who have lived in the area reportedly include artist Lucian Freud, singer Robbie Williams, entrepreneur Richard Branson and Michael Bond, creator of Paddington Bear.